Improve the nether and end! Hello! 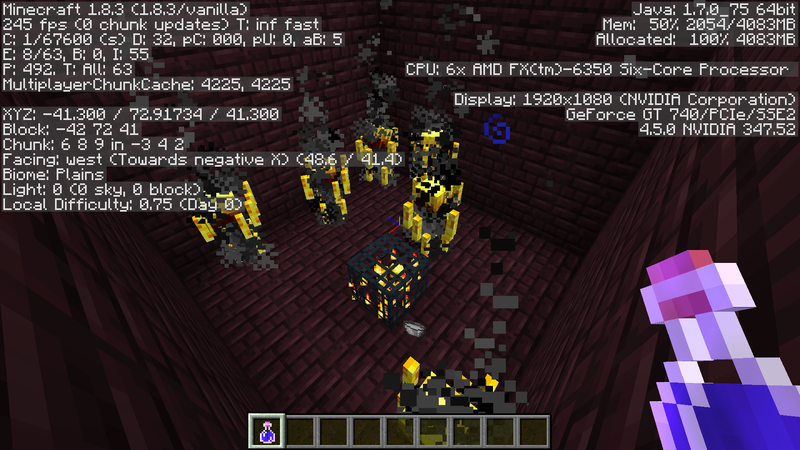 Are you tired of having conquered the nether and end multiple times? Are you tired because it is just too easy? Well, you have come to the right place! This thread is based on improving the nether and end. Lets start with the nether. Lets start with generation. Note that this will include the nether being raised to Y 256. The nether ceiling will be at 242 Y on average, only exeption being the Open Plains and Tight Plains.There will be 7 biomes in the nether. Biome 1: Lava Seas. This is a large vast area, with occasional lava falls. Rarely, there will be "lava pillars", usually 5-7 blocks in diameter. Biome 2: Tight Overhangs. This is a small area, usually 100 blocks wide, in which there is only 3-8 blocks of air in between the floor and ceiling. Biome 3: Volcanic Wastelands. This is about the size of a desert in the overworld. It is filled with small hills with lava coming out. This biome includes about 2 or 3 large volcanoes, going up to about 170 Y usually. Biome 4: The High Lands. This is a large flat area, going up to about 180 Y to 225 Y. It is the size of an overworld jungle. Biome 5: The Hidden Secrets. This is a very rare biome, rarer than the Ice spikes biome. This has the most natural structures, having 3. They are only farther out than 1200 x or z from the center, 0 x and z. This includes very rare blocks and ores, which can be used for the boss biome. Biome 6: The Open Plains. This biome has its floor close to lava level, and the ceiling raised to 251 Y. This is a good building spot in peaceful. It is typically flat, and usually spawns inside of a lava sea, similar to the mushroom biome in the overworld. Biome 7: The Withered Remains. This always spawns a gigantic fortress inside it. This is a boss biome, containing the Great wither, a wither with 5 heads and 4 times the size of the normal wither. It has 1500 health, and its defence is as if it had a full set of diamond armor. You can spawn it, but only with the head it drops. It is usually near the Hidden Secrets. This biome is about 250 blocks wide. Made of: Nether brick, Netherrack, Soul sand, Lava, Nether brick fence. Came up with Ideas, will update tomorrow. Please read the rules before posting. Asking other people for ideas isn't allowed (you can ask others to improve your ideas, but those ideas need to be established first). That is called Idea Fishing. If someone does have an idea, he/she would make a thread of his/her own about it. Will be updating post tomorrow morning.